A bit of nothing for your minds! It’s eyes stare through me into the distance, as it stands statuesque as if to look into the horizon but not actually take the views in. It stands still never trying to move anywhere, and if by some impulse it did, the shackles and chains networked round its legs wouldn’t allow movement of any more than a few feet. But it doesn’t want to move – it has probably never known freedom more than likely being born into this suffocating invisible cage. The only freedom this intelligent and aware animal is awarded is the regimented and strictly enforced yomp through a select token collection of grasses and trees to satisfy the visiting Westerners taste for the exotic. “Elephant sanctuary” the various mahouts repeatedly refer to this place as, ironically while wielding their ominous sharply spiked bullhooks. Like a suspenseful horror, the issue of the bullhooks is a hushed topic yet the symbolism of them paints a very vivid picture. The relationship between the elephant as a wild animal and the idea of domesticating and training elephants is one that many people can argue that either could be better for the welfare of the elephants. Standing here in this dusty arena however, watching an elephant knock a ball into a net dressed in a tacky David Beckham saddle throw, while another robotically drags a massive tree trunk chained to it along the ground, it’s difficult to attach the words ‘welfare’ and ‘within the elephants best interests’ to this scene. Earlier in the day, me and the lovely Cathryn (love you xxxxx) had bathed in a nearby river with the elephants and their mahouts. The elephants had seemed to lap up this outing and for a short while, their robotic demeanour giving way to a subtle sparkle as they rolled and sprayed. However, even this was a controlled environment, continuing to operate within the acceptable parameters of their controlling mahouts. But even this brief relief for the elephants leads us on to consider the elephants’ treatment when the baying mob isn’t present. 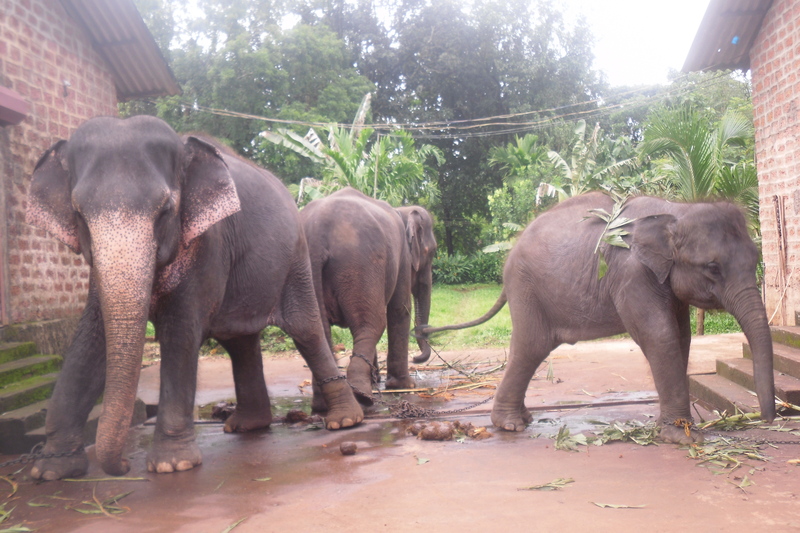 This place is called a sanctuary, giving the impression that the animals taken into care here are encouraged to display natural behaviour and provided with a safe but free environment to stimulate the elephants. This is the case with most of the other sanctuaries for the variety of animals resident within them, yet this sanctuary seems less in the elephants’ interests and more in the novelty and monetary interests of the human side of this relationship. Elephants have been studied and shown to display levels of awareness regarding their environment and their social groups. What this means is that elephants, like people, can be negatively affected by situations or events that they may encounter. Elephants have been known to identify non predator danger as well as predators and to rescue their young, as well as mourning the passing of members of their family gro ups and have even been viewed returning to a particular family member’s place of death. Elephants exposed to traumatic environments or with their natural stimulus removed are often mentally affected, with their behaviour starkly reflecting this. Bullhooks, performing elephants, shackles, and existing to amuse a crowd. 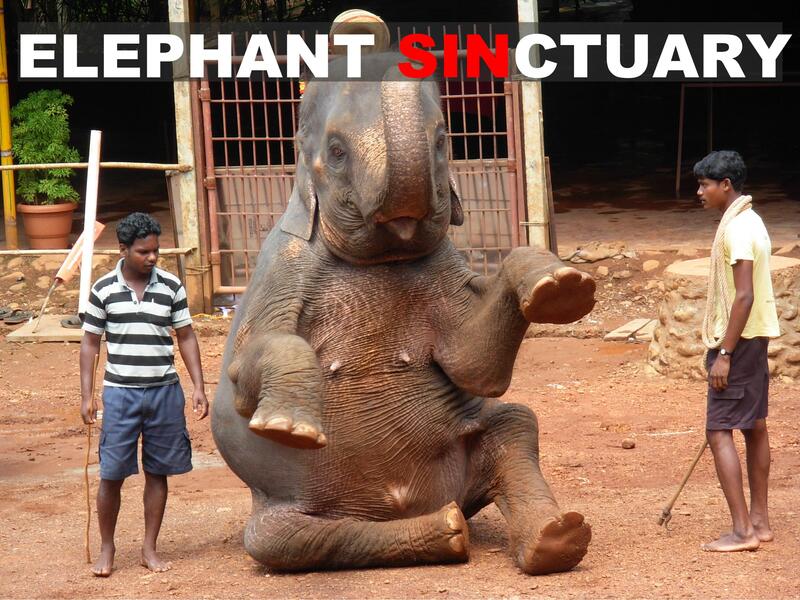 This isn’t a sanctuary, this is a circus. Indeed, it would be unfair to take this as a sweeping statement about all elephant sanctuaries, but not all of these establishments are equal, some being more of a sanctuary than others. In many cases, the culprits casually brandish the word and wave it about, playing on the good reputation and regard that other beneficial sanctuaries create through a higher level of consideration for the animals, in order to draw the notoriously animal compassionate Western tourists in. Were the establishment to be called an ‘Elephant Entertainment Show’ or even ‘Performing Elephant Compound’, this would immediately activate the negative response of most Western individuals, yet calling it an ‘Elephant Sanctuary’ effectively bridges over this negative response to the reality that the elephants are performing manipulated animals to the extent that throughout the visit, the tourists will actually repeatedly tell themselves it is a sanctuary, clouding the reality in a pure white haze of ignorance. Because after all, ignorance is not only bliss, but it makes money too.